How do you hide an airplane behind a bird? Very skillfully. Lt. Col. William B. O'Connor (ret.) 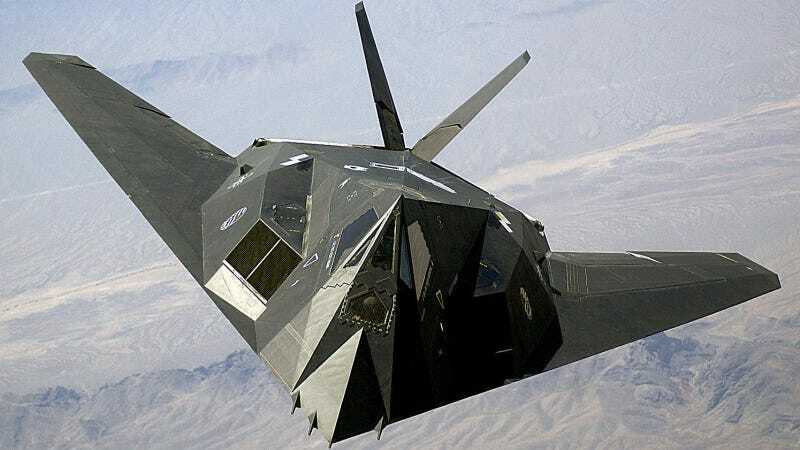 flew the F-117 Nighthawk during the Bosnia Conflict, and in Stealth Fighter, he explains the history, operation, and soul America's most advanced stealth jet. While the United States had never embraced a defensive mindset and had only fielded one strategic SAM system to that point, the Nike-Hercules dating from the 1950s, and one real medium-range tactical system, the HAWK (homing all the way killer), the Soviets had fielded over fifteen different systems. One Soviet SAM system was even armed with nuclear warheads. It had become clear that there had to be a better way. So in 1974, the U.S. Defense Advanced Research Projects Agency (DARPA) initiated a program known as Project Harvey (named after the 6 feet 3 1/2 inches tall invisible white rabbit from the play of the same name). The ultimate goal was to develop a combat aircraft with as low a radar signature as possible. Five aerospace corporations had been contracted a million dollars each to give it their best shot. Surprisingly, Lockheed hadn't been among them. It was only an accidental tip-off that allowed Lockheed's Ben Rich to lobby for inclusion. Rich had been an engineer on the secret U-2 and SR-71 reconnaissance aircraft and had by then advanced to become Lockheed's successor to the famous Kelly Johnson as director of the Skunk Works. The "Skunk Works" is the official alias for the department responsible for all of Lockheed's highly secret advanced development projects. It was formed in 1943 to build America's first jet fighter, the P-80, and numerous other projects that belong to the shadow world of military operations. By the time Rich had gotten wind of Project Harvey, there was no money left for another developmental contract. So Lockheed was offered a shot-for a dollar. But Rich wanted in and wisely turned down the token dollar. He knew that any new technologies developed with company funds would then be proprietary. Lockheed was famous for building small fleets of extremely advanced aircraft-often used for highly secretive missions. During World War II, they had built the United States' first operational subsonic jet fighter, the P-80. They skipped the Mach-1 era altogether and jumped right to fielding the United States' first fighter capable of speeds in excess of Mach 2, the F-104 Star Fighter. Along the way came the high-flying U-2, the higher-flying SR-71, the hypersonic D-21 drone (which would ride piggyback on an SR-71 until released), and other things not yet named. In Rich's own words, the unsung hero of Lockheed's effort was an anonymous staff mathematician and electrical engineer named Denys Overholser. Overholser and his mentor, another mathematician named Bill Schroeder, had discussed the possibilities of utilizing some of the equations associated with optical scattering (how electromagnetic waves bounce off variously shaped objects) on this project. Both had the rather odd hobby of reading obscure Russian mathematics papers and had made the ultimate "nerd's nerd" discovery. They had stumbled across a paper published in Moscow a decade earlier titled "Method of Edge Waves in the Physical Theory of Diffraction." It had been written by Pyotr Ufimtsev, the Soviet's chief scientist at the Moscow Institute of Radio Engineering and the last in a long line of scientists developing a long series of wave equations originally derived centuries ago by the Scottish physicist James Clerk Maxwell. The U.S. intelligence community had helped translate this research and brought it to the West. The paper was in no way classified or related to weapons development at all. It was purely theoretical math. Years later, Ufimtsev immigrated to the United States to teach at the University of California, Los Angeles, and only then discovered his inadvertent contribution to the development of stealth aircraft. The equations that Ufimtsev had developed made the reflections of radio waves off hard surfaces predictable. Not invisible, transparent, or tactical in any way-just predictable. The problem for Lockheed was that the calculations were so ferociously difficult that the most advanced supercomputers in the world at the time could only compute results for flat surfaces. Any attempt to perform the calculations for the curved surfaces you would find on a conventional aircraft-well, those machines would still be grinding away toward a solution today. Schroeder recognized how these equations could be applied to Lockheed's current project. The solution was not even to attempt to design an aircraft with any curved surfaces, but to build one with dozens, or perhaps hundreds, of individual flat triangular and rectangular plates. Then the challenge was to compute the reflection from each and every flat surface before adding them all together to build a picture of the aircraft's total radar signature. Once you knew where every bit of radar reflection was coming from, you could then reorient those individual plates so that the reflection would go off in a direction away from the radar looking at it. The process became known as "faceting." And that became the real secret-not to absorb all the radar or make the plane somehow transparent, but to make the plane's signature predictable. That predictability could then be used to shape a tactically useful aircraft. The jet would also be covered in thin sheets of RAM, but the bulk of the stealth effect was achieved by its shape. Traditionally, a single engineering specialty will take the lead during the design of a new aircraft. An aerodynamicist may be in charge of pushing through a new wing or fuselage shape, as happened with the early delta wings and area-ruled fuselages of the "Century Series" of interceptors. Sometimes it may be the power-plant guy: "Here's the engine we're going to use, build us a jet fighter for it." This is how the P-80 came about. Occasionally it may be the armaments people- the A-10 is fundamentally a massive 30mm Gatling cannon with a plane built around it. In this particular case, this was the first time the lead was owned by an electrical engineer. The computer program designed by Overholser's team to make these calculations was called Echo- 1. Armed with that tool, the first test subject, the Hopeless Diamond, was built. It was described as a diamond for obvious reasons and "hopeless" for its aerodynamic qualities (or rather, its complete lack thereof). Early radar testing of the Hopeless Diamond turned out to be staggeringly successful. The White Sands experimental radar range near Holloman AFB was used. When the radar was fired up for the initial testing, the only thing that showed up was the reflection of the pole on which the test model was supposed to be mounted. Assuming that the model had fallen off the pole, the radar operators sent technicians downrange to fix the problem. To their surprise, the ten-foot model was still in place. To test the model at all, Lockheed then had to design an invisible "stealth pole" to mount the model utilizing the same technology as the proposed fighter. The results were once again astounding, and incredulous USAF officials were called in to witness and verify the data. The first opportunity to impress these officials almost resulted in embarrassment. When the radars were turned on, the reflections, while still very small by airplane standards, were orders of magnitude larger than what the USAF officials had been led to expect. They could still clearly see a small radar return from where the model was mounted. While the Lockheed engineers were trying to explain this discrepancy, a radio call came in from a technician downrange. He reported that a bird was perched on the ten-foot model. The quick reply was an order to blow the horn of the pickup truck the guy was sitting in. As the startled bird flew away, the radar reflection on the test scope disappeared. The very idea that a combat aircraft could be made so invisible as to hide behind a bird was an opportunity that couldn't be passed up. Everything associated with the program became classified at the highest levels. The program was transferred from DARPA to the USAF special projects office. The word "stealth" was forbidden to be mentioned in any unclassified document. And in April 1976, the Ford administration gave Lockheed the go-ahead for a full-scale aircraft. The Skunk Works was officially in the stealth fighter business. Stealth Fighter: A Year in the Life of an F-117 Pilot by Lt. Col. William B. O'Connor USAF (ret.) is available from Amazon.